One of the main girls of the story described as "good-natured and picked on" she is shown to be sensitive to humans who have good handling of weapons (though it's yet to be seen if all the girls are this way in some degree). 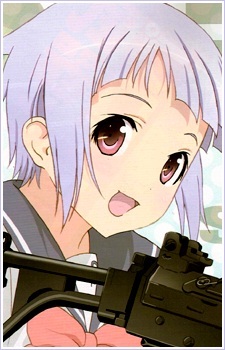 She is the first to meet the school's New Teacher, introducing herself as the Belgium-made assault rifle FNC. She also goes by the nickname 'Funko' from her older sister FAL who also had the name entered in FNC's teacher's student list (assumed to have used her position as Student Council President and good relationship with the teachers to do so) much to FNC's chargin. Because of the skeleton stock on her weapon-self she wears a T-back which gets her picked on due to an incident with the New Teacher calling her "T-back girl" and her literal return-fire putting him in the hospital twice. During the "extra lesson" battle against her older sister FAL, M14, and G3 she is one of the last to survive (along with SIG) until the New Teacher interrupts and drags her and L85A1 away for being in the upperclassman area.